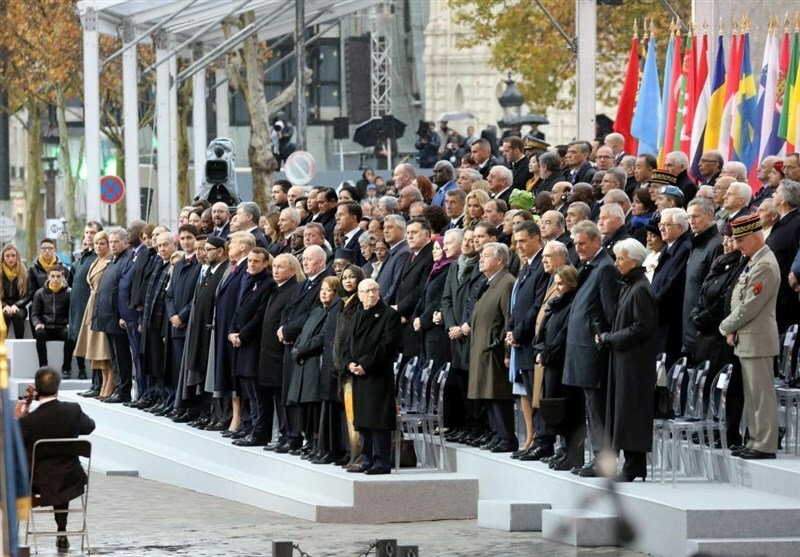 The sombre marking of the 100th anniversary of World War One in Paris Nov 11 by world leaders has several hard lessons for India, but the Narendra Modi government seems too inattentive to learn them. The first lesson is not to fight a foreign power’s (read in 21st Century Asia US’) battles, become cannon fodder in its military ventures (as signing the foundational accords puts them on the way to becoming), as Indian troops who disembarked on Europe’s shores in September 1915 as part of Field Marshal Douglas Haig’s 1st Army in France and Belgium, were. The case that armaments self-sufficiency epitomizes national sovereignty has been repeatedly made in my last two books — ‘Why India is Not a Great Power (Yet)’ and the recent ‘Staggering Forward: Narendra Modi and India’s Global Ambition’. But such a clear linkage has not been publicly made by any world leader until now by Macron, because the international discourse until everything began going wrong was the myth of “geoeconomics” and “interdependence”. Of course, in conceptualizing an European military force independent of the US and NATO, Macron obviously hopes European countries will contract for military hardware and services from Dassault Avions, MBD, DCNS, Thales, SNECMA, et al and keep the flagging French defence industry from going under. But the larger theme he highlighted that European sovereignty isn’t served by buying American military equipment and enriching the US defence industry — which is what Trump would have NATO member states do, holds. It is the longtime NATO-European malady of relying on the US and American arms that Macron has urged resistance against, now afflicts India and its government in trumps. As the military indigenisation group active on the net, SITARA, headed by a former Ambassador to Switzerland, Smita Purshottam, has pointed out, in closed councils even DRDO scientists and engineers tasked with making the country self-sufficient in arms, smirk any time any one brings up the issue of stopping imports and going in for full indigenous development of major military hardware which the Indian private sector is entirely capable of, used as they are to taking the easy way out: Importing technologies, assemblies, sub-assemblies, and sub-systems from diverse sources, “integrating” them, producing something, and calling this a huge advance on the path to self-reliance in arms! It is in the vested interest of the Indian political class, the despair-inducing state bureaucracy, and the be-medaled flag-rank uniformed brass to swallow such nonsense whole. They are so inclined because how else are Western residential visas, work visas, and “scholarships” to be secured for progeny, shopping sprees in New York, Los Angeles, Paris, London, Stockholm, and Rome by families of those inside and outside the defence procurement loop to be financed, and the health of the performance, productivity, and technology ingestion-wise dismal socialist era defence public sector units (DPSUs) to be assured? No surprise then that Modi’s much trumpeted ‘Make in India’ policy exactly fits the GOI-MOD-Finance Ministry-DPSU way of doing things — screwdrivering stuff from imported kits, and passing it off as ‘Made in India’ when genuine MADE IN INDIA requires that all research, and the process of designing, developing and producing armaments be carried out by Indians in Indian firms in India. It is only then that Modi or any other the PM of the day will be able to credibly claim for India the status of security provider to, at a minimum, countries in the Indian Ocean basin and Southeast Asia. In an alternative reality, were India really sovereign and boasted only home-designed and built weaponry, it’d be standout nation that even distant states would consider a go-to friend and partner, and an Indian Prime Minister would then be able to restate the above Macron statement but with India replacing Europe, and South Asian neighbours, Gulf countries, the East African littoral, and Southeast Asian states replacing Hungary, Poland and Finland, with this entire group of vulnerable Asian nations asking for Indian protection and security assistance against a rampaging China rather than calling in extra-regional entities such as the US for help. The other thing that was on notice in Paris was the not so subtle display of change in the rank ordering of countries. Even as the phalanx of invited world leaders (Naidu included) stood at their assigned positions to salute the “unknown fallen” in war, Trump kept all waiting. The US President finally made a late appearance only to be upstaged by the Russian President Vladimir Putin, who strolled in last and was ceremonially escorted to the frontline of the podium. And unlike Trump, he was not snubbed or rebuked by Western European leaders, or upbraided by the host, indeed Macron made it a point in the Zakaria interview to implicitly elevate Russia, along with China, as the threat that a European-armed “real European army” would defend European states against. The reason Putin strutted onto the stage is not hard to see. The Russian military has just conducted a couple of the largest war exercises in recent times — ‘Vostok 2018’ and ‘East 2018’. These involved 300,000 troops (including, incidentally, 35,000 PLA troops), 36,000 tanks and other armoured vehicles, 1000 combat aircraft, helicopters and drones and 80 warships and ancillaries in, what Russian defence minister Sergei Shoigu called, “conditions as close to a combat situation as possible.” NATO was quick to condemn these war games as demonstrating “Russia’s focus on exercising large-scale conflict”. But that was just the message Putin wanted to drive home, that he can intervene in Syria or anywhere else, do another Crimea in eastern Ukraine or whatever else he pleases, and US and NATO can do squat about it. This is Putin’s Russia our low-sighted, strategically blind, America-besotted, Modi government, which instead of reassuring Moscow by reaffirming India’s strategic autonomy, has set out to alienate by following through on a tilt-policy set in motion during Vajpayee’s days, which gathered momentum during the Manmohan Singh decade, and is reaching its culmination under Modi. It has India jumping into bed with US led by Trump and his henchmen — Bolton, Pompeo, confidence in whom , Macron says, Europe has lost. This entry was posted in Africa, arms exports, asia-Pacific/Indo-Pacific, Asian geopolitics, Bangladesh, Bhutan, China, China military, civil-military relations, corruption, Culture, Decision-making, Defence Industry, domestic politics, DRDO, Europe, Geopolitics, Great Power imperatives, India's China Policy, India's strategic thinking and policy, Indian Air Force, Indian Army, Indian Navy, Indian Ocean, indian policy -- Israel, Iran and West Asia, Iran and West Asia, Maldives, MEA/foreign policy, Military Acquisitions, Military/military advice, Missiles, Myanmar, Nepal, Nuclear Policy & Strategy, Nuclear Weapons, Pakistan, Relations with Russia, Russia, russian assistance, russian military, SAARC, society, South Asia, South East Asia, Sri Lanka, Strategic Relations with South East Asia & Far East, Strategic Relations with the US & West, Technology transfer, United States, US., Vietnam, Weapons. Bookmark the permalink. We need indo- European corridor. Blocking china in Indian ocean from east and west of India. Limiting china to central asia and pacific ocean. In competition with russia and america for influence. Wrt to indigenous arms research and manufacturing, heres whats written in an article today in the “tribune India” about inducting the Dhanush and ATAGS artillery guns in to the Indian Army. But the fact remains that such wisdom has dawned only because the artillery guns import option has remained shut for close to 30 years due to the Bofors scandal. As long as the import options remain open to the Indian military they never settle for indigenous stuff.History shows that once the import taps dry up only then do domestic efforts bear fruit eg: the ballistic missiles program and ISRO.Otherwise the military brass loses no opportunity to make it tough for Indian developed efforts,starting from the big platforms like the Marut jet,Arjun tank,Tejas LCA etc to the recent rejection of the OFBs developed 7.62 assault rifle in favor of 6.5 lac AK103 and 60 0dd thousand Sigsauer assault rifle. The modus operandi is the same ,keep delaying the induction of the kit by making incessant demands for more features(qualitative requirements)as soon as the previous ones get fulfilled.In the meantime keep pressuring the Government by repeatedly bleating about depleted war fighting capabilities until there’s no option but to import the requirements. Otherwise how do you get a Government that has a successful indigenous missiles and space rocket program to import assault rifles?